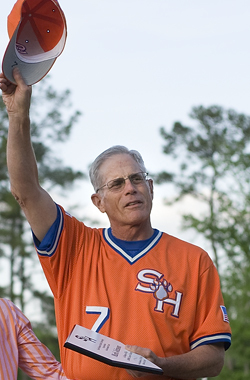 Mark Johnson, head baseball coach at Sam Houston State University the past four years and a veteran of 41 years in the coaching profession, announced Wednesday that he will retire at the end of the 2011 season. Johnson's 25-year record as a head coach at SHSU and Texas A&M stands at 1,008 victories, 540 losses and three ties. He is the 44th head coach all-time to total 1,000 coaching wins at the NCAA Division I level and ranks 17th in total victories by active baseball head coaches. "When I interviewed for the position here at Sam Houston, I made it clear that I would commit to four or five years and then take it one year at a time," Johnson said. "During the past five to six months, the thought of retirement has entered my mind. After considerable prayer and discussion with family and close friends, I have reached the decision that the time for my final season of coaching is upon me. I am very comfortable and at peace with this decision." Johnson informed his players at a team meeting at 2:30 p.m. Wednesday afternoon. The Bearkats will begin their 2011 schedule with a three-game series at Tulane Friday, Feb. 18. "Out of respect for the university and this program, I felt that now is the best time for this notice rather than at the end of the season," Johnson said. "This gives everyone ample notice and should be helpful in the expedient selection of my successor." Johnson's Bearkats have won three of the last four Southland Conference post-season tournament championships, advancing to the NCAA baseball regionals in 2007, 2008 and 2009. Johnson was named as Sam Houston head coach on July 16, 2006, and has led the Kats to a four-year mark of 132 victories and 109 losses. "I have absolutely loved being part of Sam Houston State University and forever will be grateful to Bobby Williams for giving me the opportunity to coach here," Johnson said. "Both Linda and I have fallen in love with this university, its people and direction. Sam Houston is very clearly and quickly moving upward to its rightful spot among elite universities in our state. I am proud to have been a very small part of that growth." In the past four years, the Bearkats have set 26 school records including most RBIs, hits, doubles and triples and best team batting average (.335). Three Bearkats have been recognized as All-America and, in 2007, Sam Houston produced the NCAA Division I baseball "Closer of the Year" in Luke Prihoda. "Mark Johnson has lifted the Sam Houston baseball program to a new level and the Bearkat athletic program has benefited from his service as our head baseball coach," Director of Athletics Bobby Williams said. "We have been blessed to have him as our coach. His integrity and principle-based leadership qualities have enhanced student-athletes, other coaches and administration during his time here. "His record of three Southland tournament championships and consecutive NCAA regional appearances is remarkable. Equally as impressive are the accomplishments of his student-athletes in the classroom." During the past four years, Sam Houston baseball players have been selected as Academic All-Southland Conference seven times. Baseball student-athletes have earned Southland Conference Commissioner's Honor Roll recognition a total of 55 times. In 2007, Prihoda was recognized as Southland Conference baseball "Student-Athlete of the Year." "After 41 years of coaching, we know Mark and his family look forward to enjoying his retirement," Williams said. "We also know that Mark will take the field with the same energy and will to win that he did his first game as a coach. We thank him for all his hard work and accomplishments as part of the Bearkat family." "In NCAA Divison I coaching, there is absolutely no slowing down process," Johnson said. "I have been at this level for 41 years and will be 66 years old this summer. As my age creeps upward, I am reminded of my resolve over the years that I not overstay my profession or compromise my personal coaching standards in regard to my physical, mental and emotionally capabilities and energies. "I am healthy and still at full speed. I am excited about this coming season as any time I've coached. When the season is over, it will be my time to step aside and let younger coaches take over. It will be my time to reclaim my weekends, get off the clock and spend more time with Linda, our families and our five grandchildren."